Welcome to the four hundred and forty-seventh of my blog interviews with novelists, poets, short story authors, biographers, agents, publishers and more. Today’s is with thriller and children’s fantasy author Philip Caveney. A list of interviewees (blogged and scheduled) can be found here. If you like what you read, please do go and investigate further. Morgen: Hello, Philip. Please tell us something about yourself, where you’re based, and how you came to be a writer. 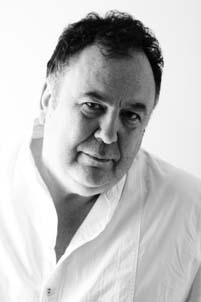 Philip: I’m an author of both children’s and adult’s fiction. I live in Heaton Moor, near Manchester in the UK. I started writing when I was a teenager, after being blown away by Ray Bradbury’s fabulous fantasy novel Something Wicked This Way Comes. Morgen: I’ve heard of it but never read it… I clearly should. 🙂 What genre do you generally write and have you considered other genres? Philip: My adult works are thrillers and my children’s books (which are considerably more successful), are in the fantasy genre. Morgen: That’s really interesting; that your children’s books are more successful, I guess there’s less competition? What have you had published to-date? Philip: I’ve published over twenty books during my career. Best know to American audiences are the Sebastian Darke adventures, featuring a half-elvish, half-human wannabe jester. They’ve sold all over the world. Morgen: They do sound fun. 🙂 Have you had any rejections? If so, how do you deal with them? Philip: All authors get rejections. You have to develop a thick skin and push on regardless. It always helps to remind yourself that a rejection is generally the result of one person’s opinion. Morgen: Absolutely. Have you won or been shortlisted in any competitions? Philip: I’ve been shortlisted for quite a few book prizes in the UK, but have yet to actually win one. Always the bridesmaid, never the bride! Morgen: Yet… 🙂 Do you have an agent? Morgen: Oh dear… I fear I might be the same… I eBook my work because I love having control, although I’m sure I would respect a good agent’s expertise. Do you think they’re vital to an author’s success? Philip: I think for a first book, an agent can really help to get your work read. Morgen: I’m sure you’re right… especially with getting a top publisher. I mentioned eBooks, are your books available as eBooks? Were you involved in that process at all? Do you read eBooks or is it paper all the way? Philip: All my children’s books are available as eBooks, including one, The Talent, that is ONLY available as an eBook. Eight of my out-of-print adult thrillers were published earlier this month. Morgen: How exciting. 🙂 How much of the marketing do you do for your published works or indeed for yourself as a ‘brand’? Philip: If it’s a traditionally published book (which it usually is) I leave that side of things to the publisher, though I do love to go out to schools and libraries to promote the children’s books. The Talent is slightly different. Since I published it myself via kindle direct, I am investigating many different avenues in an attempt to spread the word. Morgen: Social networking seems to be the key, although interspersed with ‘useful’ or ‘informative’ tweets about something else. Do you have a favourite of your books or characters? If any of your books were made into films, who would you have as the leading actor/s? Philip: My latest book, Night On Terror Island, is under consideration by a major Hollywood production company. I would love to see Max Von Sydow play the character of Mr Lazarus. Other than that, it would be a cast of unknowns. Morgen: Oh yes, I like him. 🙂 Did you have any say in the titles / covers of your books? How important do you think they are? Philip: Covers are really important and I’m fortunate enough to get good ones! Morgen: They are very striking. What are you working on at the moment / next? Philip: I’m writing a book called Space Blasters, which is the third book in my Movie Maniacs series. It follows Night On Terror Island and Spy Another Day. Philip: I write most days, but do spend quite a bit of time visiting schools and so forth. I have never (thankfully) suffered from writer’s block! Morgen: Me neither but then I don’t stick to genre and it sounds as if you have enough variety too. Do you plot your stories or do you just get an idea and run with it? Philip: These days I create the characters, put them in a background and let things happen. It’s almost as if the characters themselves come up with the plot! Morgen: They do, and that’s my favourite aspect of writing. Do you have a method for creating your characters, their names and what do you think makes them believable? Philip: I just imagine them and the names come more or less automatically. I spend a lot of time inhabiting them, it’s a kind of role play. Morgen: 🙂 Do you write any poetry? Philip: I rarely write poetry. To be honest, it’s a completely different technique to writing fiction and it’s probably my weakest asset. Morgen: Oh me too – I say I don’t “get it” but then I’ve never been taught (or read it) so that doesn’t help. Do you write any non-fiction or short stories? Philip: I’ve done a lot of short stories, which have appeared here and there, but never managed to get a collection off the ground, which is a shame, because I love the form. For non-fiction I write film and restaurant reviews. Morgen: It is a shame, they’re my favourite form but hard to sell (although I probably don’t market them well enough). Do you do a lot of editing or do you find that as time goes on your writing is more fully-formed? Philip: It’s certainly more fully-formed than it used to be, but I give every book at least three drafts. Philip: Only for the Alec Devlin books. These were set in the 1920’s and concerned ancient civilizations, so the research had to be spot on. Morgen: It does because there will always be an ‘expert’ out there only too eager to point out inaccuracies. 🙂 What point of view do you find most to your liking: first person or third person? Have you ever tried second person? Philip: I’ve written in both the third and first person, and like them both, but not everything works in first person. The second person I’m less comfortable with. Morgen: That’s not really surprising as you write novels – it’s my favourite viewpoint but I write very short pieces which suits second person better; Sunday’s 5pm fiction piece was just 44 words). 🙂 Do you have pieces of work that you think will never see light of day? Philip: Not now we have kindle direct! There are quite a few unsold manuscripts tucked away that for one reason or another, didn’t quite make it past the finishing post – so in time, they WILL be published. Morgen: I hope so too with mine – with practice it’s easier to go back and see what’s wrong. What’s your favourite / least favourite aspect of your writing life? Has anything surprised you? Philip: The time everything takes! The book I’m writing now won’t see publication until May 2013. I used to fondly imagine that you finished a book on Monday and it was in the shops by Friday! Morgen: 🙂 It can be when self-publishing eBooks… although not in the shops but online seems to be the way everything’s headed. What advice would you give aspiring writers? Philip: Two things. If you want it more than anything else, then never give up. And, don’t be afraid to rewrite. The worst that can happen is your book will be a little bit better – the best that can happen is that it will be brilliant. Philip: I hate this question! Philip: I’d invite the first three names that occurred to me at the time and I’d cook king prawn linguine (my speciality). Philip: I run a writers group in my hometown called Writers Inc – and I do a day a week at a University (currently Lancaster) teaching writing skills on behalf of the Royal Literary Fund. Philip: I go to the cinema – a lot! I don’t have any tricks worth mentioning. Morgen: 🙂 Are there any writing-related books that you find useful? Philip: Books on how to write aren’t very useful in my experience. The only one I thought was of any use was Stephen King’s On Writing. Morgen: A very popular choice in these interviews. Are you on any forums or networking sites? If so, how valuable do you find them? Philip: When ‘The Talent’ came out, I joined a lot of blogging sites, thinking I could promote it there. But of course, I got lots of other writers (and, it must be said, would-be writers) trying to sell me their books! Morgen: Sadly that happens a lot. I think many writers realise how strong the competition is and think by shouting the loudest they’ll get spotted but it doesn’t work like that. What do you think the future holds for a writer? Philip: I think the future is looking rather bleak for anyone who actually wants to make money from their writing. The book industry is currently going through what happened to the music industry with the onset of digital publishing. Philip: Just Google my name! Or, go to my websites: http://philip-caveney.co.uk and www.writers-inc.org.uk. Philip: I’m a good speaker and I love doing school visits! Morgen: Two-thirds of this blog’s traffic is generally from the US, the rest mainly the UK so let’s hope you have some offers. 🙂 Is there anything you’d like to ask me? Philip: How’s the weather where you are? Morgen: One I’ve not been asked before here… 🙂 Mixed today; light / dark clouds and blue sky… typical English summer; can’t make up its mind. Thank you for chatting with me today, Philip. It’s the scariest movie ever – and they’re stuck in it!